Athens, GA (Feb 29, 2008) - Last month, Eye on Sports Media told you about the annual West Point Brigade Boxing Open. Well the time is here, and and the championship bouts, completed on February 26, 2008, will be broadcast tomorrow night on ESPNU at 8:00 PM EST. If you want to see accomplished professional boxers choose their punches with tedious caution, get your hands on that Wladimir Klitschko-Sultan Ibragimov fight from the other night. If you want to see inexperienced amateurs hit each other non-stop for three rounds, the Brigade Boxing Open is the place to be. The 52nd annual event provided another punching party last night at Hayes Gymnasium. The West Point championships were so entertaining, in fact, that color commentator Teddy Atlas, with Joe Tessitore announcing the fights for ESPNU, had trouble naming the outstanding boxer. If you get ESPNU, this might provide a great diversion for you, especially if you want to watch pure boxing action. In fact, the storyline of a Plebe (freshman) wining the big fight against a First Classman (senior) might make a great movie. Oh wait, that is the storyline in Annapolis. This story, however is real. 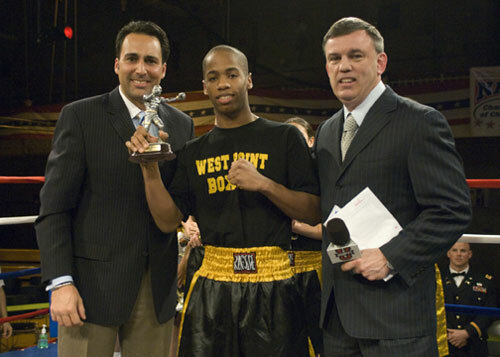 ESPN Boxing Analyst Teddy Atlas (l) and Announcer Joe Tessitore (r) with Plebe Freshman Terrell Anthony, named the 2008 West Point Brigade Boxing Open Outstanding Boxer. Photograph Courtesy of the United State Military Academy Sports Information Office.